On Friday I was in Birmingham for a meeting of the Arts Development UK (ADUK) Professional Development Working Party. We were joined by Jessica Harris from NCVO to discuss the Cultural Commissioning Programme (CCP) and the potential for links between the CCP learning programme and the ADUK professional fellowship programme. We also considered the possibility of further ADUK national events to share learning and research from the CCP, following the success of the initial national seminars on cultural commissioning in June 2014. We then discussed the ADUK Conference which will take place at the Wales Millennium Centre in Cardiff on 16/17 October, where the keynote speaker will be the Chair of Voluntary Arts, Peter Stark. You can book your conference place at: http://artsdevelopmentuk.org/2014/08/arts-development-uk-conference-arts-for-life/. We were delighted to learn that the 2016 ADUK Conference will be hosted by Hull, UK City of Culture 2016. We also looked at the programme for the next ADUK national seminar which will focus on Arts & Health and will take place at the Catrin Finch Centre at Wrexham University in February or March 2015. The ADUK Professional Development Working Party then discussed ‘Our Cultural Commons’ – which is a partnership between Voluntary Arts and ADUK. We looked in particular at the scoping research currently being undertaken by the C3 Consultancy, led by Sue Isherwood, and talked about how best to publicise Sue’s call for existing examples of innovative, collaborative approaches to local cultural infrastructure. We also considered how the proposed Our Cultural Commons national event in June or July 2015 would fit into ADUK’s wider events programme. Finally we reviewed the ADUK Professional Fellowship Programme, which has now been running for three years, and discussed how to encourage more ADUK members to take part and the potential for further progression beyond the level of Senior Fellow. The fellowship programme is a really interesting way of encouraging and enabling continuing professional development for people working in local arts development and it is good to see how well the scheme has been taken up so far. I was in Peterborough on Monday to meet Josie Hickin, the new Creative People and Places Programme Manager for Connection Culture. The Peterborough Creative People and Places consortium (of which Voluntary Arts is a member) has employed Josie to lead its programme to increase engagement in the arts in Peterborough. We talked about the various strands of the Connection Culture programme (focussing on young people, diverse communities and the voluntary arts sector – supported by the ‘Chamber of Culture’ which is providing training and mentoring). We discussed some of the particular challenges we are likely to face and the role each of the consortium partners will play in the delivery of the programme strands. It’s great to have Josie in post and I hope the Connection Culture programme will now really start to take shape. On Wednesday I was in Peterborough for a meeting of the Creative People and Places consortium – now called ‘Connection Culture’. We worked on the details of the three main strands of our programme to increase engagement in the arts in Peterborough. These strands focus on young people, diverse communities and voluntary arts groups and will be backed up by a ‘Chamber of Culture’ which will provide advice, training and mentoring to local artists and cultural organisations. Last Saturday I was at the Questors Theatre in London for the start of our latest RSC Open Stages Skills Sharing Weekend. Questors, founded in 1929, is the largest non-professional theatre company in Europe and hosts a season of around twenty productions a year. Questors is the only amateur theatre company among the regional partner theatres supporting Open Stages and acts as a hub for the amateur theatre groups in London and the South East taking part in the current Open Stages project. 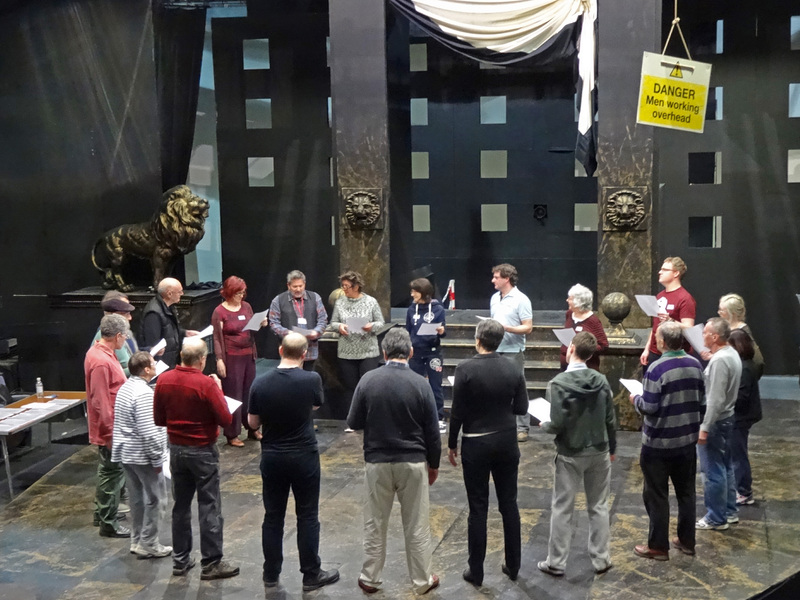 On Saturday around 100 amateur actors from participating groups gathered at the Questors Theatre in Ealing to take part in workshops on voice, acting, movement and stage combat, led by the RSC’s team of professional expert facilitators. I’m always incredibly impressed by the standard of the amateur actors we see at the Open Stages skills sharing sessions. Invariably they tackle exercises used by drama schools and professional theatre companies with a level of skill, creativity and experience that makes it impossible to tell that you are not actually watching an internal RSC training session. On Saturday we were joined by Erica Whyman, the Deputy Artistic Director of the Royal Shakespeare Company. Erica joined the RSC in January 2013 and works closely with Artistic Director, Gregory Doran, on all aspects of artistic strategy. She now has overall responsibility for the Open Stages project and the RSC’s programme of work with amateur theatre and this was her first experience of an Open Stages skills-sharing weekend. I talked to Erica about the origins and development of Open Stages and the RSC’s plans for further work with the amateur theatre sector beyond the end of the current Open Stages project.